James Warren Morris, 81, of Gay passed away on Wednesday, October 24, 2018. He was born in Atlanta, GA on June 13, 1937 to the late Elisha and Charlsie Morris. He was retired from the City of Atlanta where he was a Civil Engineer after 30 plus years. 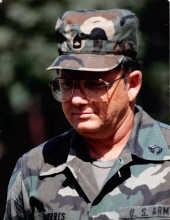 Mr. Morris also proudly served his country in the United States Army and National Guard for 30 years. He was a member of Luthersville Baptist Church, where he served as a deacon. Mr. Morris is survived by his wife of 60 years, Montine Morris; his son, Gregg Morris; his daughter, Pam Paré (Mike); his grandchildren, Nicole Morris, Kim Frazer (Lenny), Justin Shaneyfelt (Shelia), Tyler Shaneyfelt, Chris Morris, Jason Morris, Tanner Morris, Rachel Paré and Brittany Paré; his great-grandchildren, Chase, Natalee, Devin, Jenna, Hayden, Hunter and Macie; his niece, Donna Anglin, his nephews, Freddy Walker, III, Billy Werner and Derrick Werner. A funeral service will be at 12:00 PM on Saturday, October 27, 2018 in the Chapel of Mowell Funeral Home, Fayetteville, GA, with Pastor John Pape officiating. Burial will follow the service at Fairview Memorial Gardens, Stockbridge, GA. The family will receive friends from 5:00-8:00 PM on Friday evening, October 26, 2018 at the funeral home. To send flowers or a remembrance gift to the family of James Warren Morris, please visit our Tribute Store. "Email Address" would like to share the life celebration of James Warren Morris. Click on the "link" to go to share a favorite memory or leave a condolence message for the family.